The New York Rangers ended the month of October trending up in at least one aspect: goal-scoring. They opened the season scoring three or more goals only once, and that was in an 8-5 loss to the Toronto Maple Leafs. In this opening start to the season, they lost five of those six games. Though the Rangers are far from fixing what ails them, which is their defensive play, at least their offense has come around lately. They have scored three or more goals in six of their last seven games, which has masked their defensive woes and led to a slightly better record over this stretch at 3-2-2. That’s good for eight points in seven games. Not great, but something to build off for New York. Two key players in this run have been Mika Zibanejad and Pavel Buchnevich, who both ended October on modest four-game point streaks. In the seven-game run of increased scoring, Zibanejad tallied up eight points (three goals and five assists) and Buchnevich seven points (five goals and two assists). It has been an up and down start to the season for Zibanejad. He opened the year by scoring five goals in the opening four games, but managed one assist over the next five games, only to follow that up with seven points in the next four games. On the season, he has 13 points in 13 games. His production is there, despite it coming in streaks. A more consistent contribution from the team’s number one center could help in the long run, but again, one cannot really argue with averaging a point per game. On the flip side, Buchnevich struggled to get going to start this campaign but has seemed to hit his groove at the end of the month. In the first eight games, Buchnevich only managed one goal and three assists. But in the last four games of October, he had four goals and two assists and has seen an increase in shifts and in ice time. Over that four-game span, his shifts per game increased from 18.3 to 20 and time-on-ice jumped from 14:38 per game to 15:05 per game. If Buchnevich continues to produce, expect both of these numbers to continue to rise. The opponents in this stretch of seven games, however, have not been top defending teams. The Rangers scored four or more goals against the Arizona Coyotes, Pittsburgh Penguins, and Montreal Canadiens. All three of those teams listed sit in the bottom four of the league in goals against per game. And the six goals against the Vegas Golden Knights came against their fourth-string goaltender. Heading into that matchup, the Golden Knights were tied for the fourth-best goals-against in the league. If you are the Rangers, though, you can only play the teams on the schedule. With how poorly they opened up the season scoring-wise, any production is good production. It helps to play poor defending teams, but you still need to finish, which the Rangers did very little of in those opening six games. So much about sports is about confidence, too. In basketball, sometimes you just need to see the ball go through the hoop to gain some confidence. The same can be said about hockey. The Rangers were pressing early on for goals, so, at the very least, this goal-scoring spree can give a struggling team some confidence heading into November and beyond. With all this said, the Rangers still allowed 3.54 goals against per game in October and surrendered three or more goals in 10 of their opening 13 games – not a recipe for success for any team no matter how much you score. Team giveaways still continue to be an issue, especially at home – the Rangers have had fewer giveaways than their opponent only twice thus far to start the season. It should not come as a shock that the Rangers led the NHL in giveaways for the month of October. They accrued 217 through 13 games. That’s 16.69 giveaways per game. The next worst culprits were the San Jose Sharks, with 165 through 11 games, which equals 15 giveaways per game. And the splits at home are even worse. The Rangers averaged only 10 giveaways per game on the road compared to 18.7 at home. Weirdly, they only played three road games in the entire month of October. Gutsy, hard, winning hockey from the Rangers in the 3rd. Doesn't erase the 1st 40. It was vs a No.4 goalie and a tired team. But it was big. But giveaways are not the only issue defensively with the Rangers. All season they have struggled to pick up opponents in their own zone, leading to wide-open, high quality scoring chances. This is an issue Larry Brooks of the New York Post touches on after the comeback win against the Golden Knights. 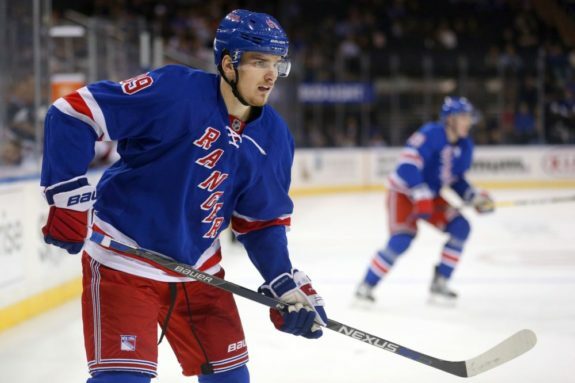 He discusses the faults concerning the Rangers defensive core, as well as the ineffective play of Brendan Smith. Since signing a new contract to stay in New York, he has looked like a shell of his former self this season compared to how well he played for the Rangers last year. And according to Brooks, he only managed 34 seconds of ice-time in that third period win against the Golden Knights. So, until the Rangers become smarter in their own zone and become smarter with the puck, they will struggle to pick up wins against quality opponents, even with their increased production offensively. But if you’re New York, you take all the positives you can to rebound from this early season slump.